Because VBA is a programming language, it shares common principles and elements with other languages. Ones of them are variables. A variable is a reserved place in a computer memory that can be used by a program. Excel stores there the value assigned to that variable. It means that you reserve 2 bytes for the integer value. VBA will automatically create its default type called Variant. This data type can be very handy because it changes its type depending on what you actually do with the variable. For example, if you enter „56”, it can behave as a number or as a text string. When you want to declare multiple variables, you can create each declaration in a new line. But there is another faster method where you need only one line of code. If all of your variables are of the same type, you still have to declare it to each variable separately. The following code will be valid. But only the third variable will be treated as an integer. The first and second variables will be treated as Variants. It’s a good practice to declare all your variables at the beginning of your code, not only for practical reasons but also because the macro will run faster. If you don’t do this it is easier to make a mistake. That because there is a mistake in the code. Instead of myVal = myVal + 3 there is myVar = myVal + 3. It can be easily overlooked and the result will be wrong. 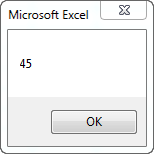 at the very beginning of your code, Excel will require from you to declare each variable you use. 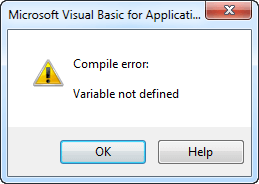 Now when you execute your code you get the error informing you that the variable is not defined.